Southern comfort in a can is the latest Deal of the Day's offering. In the manner of Jewish Matzo Balls or Chinese Won Tons, Dumplings & Chicken by Comfort Creek Foods are tender dough slabs in a flavorful broth. At just 15 ounces, it's a hearty meal in a tin. I'm always a bit wary of canned meals -- chile with beans is about the only canned dish that sometimes works. Soups are always lacking in veggies, meat and noddles (or rice.) 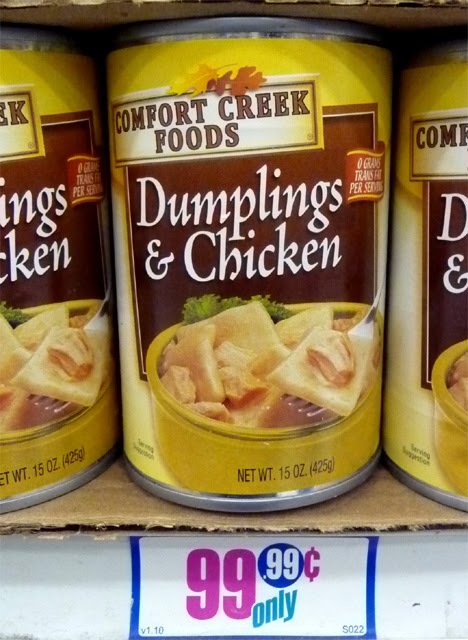 I'll give Comfort Creek Foods credit for loading the can with fat dumplings and tender white meat chicken chunks. 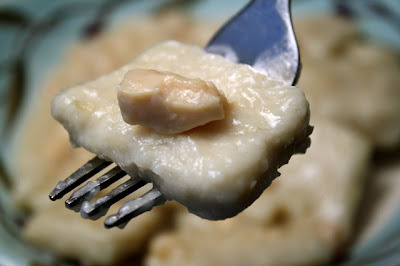 I think the last time I had Chicken and Dumplings was sitting on my grandmothers lap and being spoon-fed as a 4 year old! And after putting away this loaded Deal of the Day you'll be ready for your nap. The dumplings are as large as poker chips and the chicken pieces actually match the size of the label photo. I could not detect any veggies in the gravy; some pieces of celery and onion would've been nice. And more chicken would have been even better -- I guess that's why it's labeled as "Dumplings & Chicken" not the more traditional "Chicken & Dumplings." As for the gravy, it's awfully salty; while not quite a salt lick in a canister, it is a common problem with canned foodstuffs, so I'm not too surprised. And I would have liked more liquid or broth mixed into the gravy. When I heated it in a pot on the stove top, what little liquid there was almost cooked away. 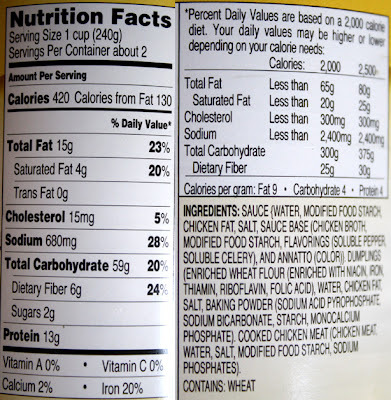 Maybe they should put somewhere on the label "add 1/4 cup of water". 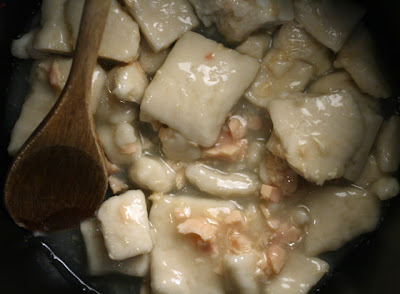 The dumplings themselves are firm but not too much so, and the taste is light and doughy, flavored by the chicken gravy. So all in all it's not a bad Deal of the Day. On a scale of 1 to 9, 9 being best, I give Comfort Creek Foods Dumplings & Chicken a big fat 6. 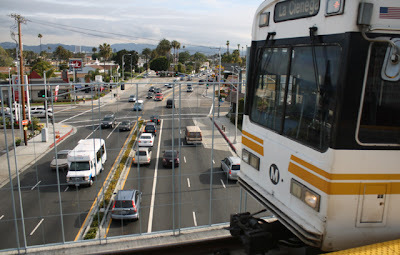 From my home in the Village Green, I can walk to L.A.'s latest transportation option, the Expo Line - so now my visitors can ride along with the Chintziest of Commuters to get a cheap-eyed view. 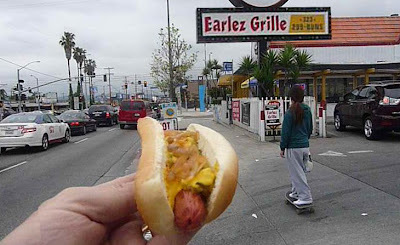 And be prepared to stop along the way for economical eats: from flame broiled $1.25 hot dogs at Earlez Grille on Crenshaw Boulevard, to a 99-cent (per piece) sushi Happy Hour at Octopus Japanese Restaurant downtown, from a delicious $1.50 Birria Taco on homemade tortillas at Danny's Tacos (also downtown), to luscious free candy samples from See's Candy in Culver City, and finishing up at the end of the Expo line on Venice Boulevard in Culver City for hormone free hot dogs from Let's Be Frank, and a vegetarian feast at India Sweets & Spices -- both a measly $5.50. The Expo Line runs 8.6 miles, from downtown's 7th Street Metro station at Figueroa Boulevard, to Venice Boulevard in mid-City. 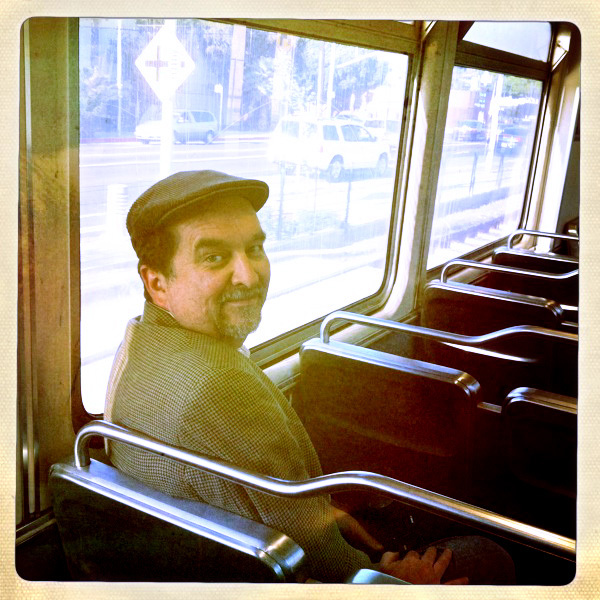 The rail cars are sleek, smooth, air-conditioned. They operate from about 5 a.m. until just past midnight, and the ride only costs $1.50 one way (click here for all the fares.) There are 10 new stations in operation (2 more on the way,) with the trains stopping about every 15 minutes -- click here for a PDF of daily schedule stops. 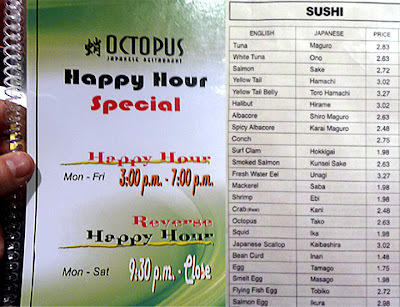 First up is the great sushi happy hour at the Japanese restaurant Octopus. 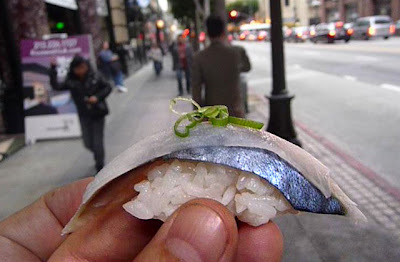 You'll find better and more expensive sushi joints in Little Tokyo (about 10 city blocks away), but for cheap, fresh and tasty fish in a stylish atmosphere, this is the closest station stop -- it's on 7th Street, just a block east of Figueroa Boulevard. Two-piece orders run from $1.98 for Mackerel, to $3.27 for Yellowtail Belly, along with drink specials. 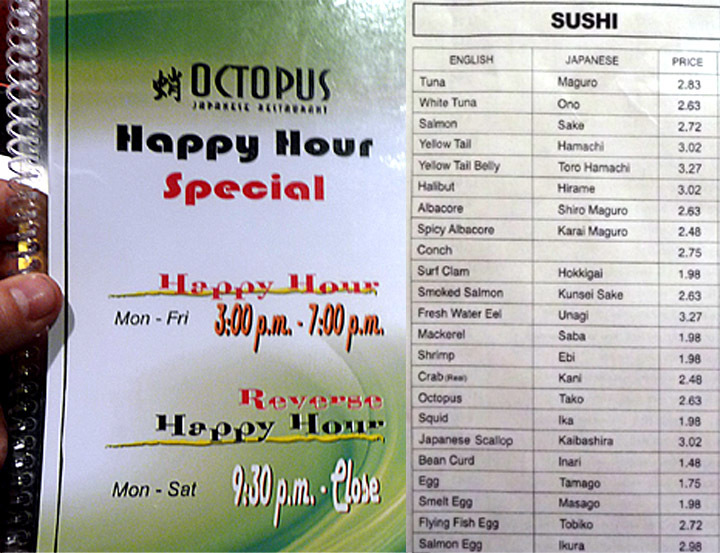 Happy Hour is from 3 p.m. to 7 p.m. Monday through Friday (followed by a late-night 'reverse Happy Hour'.) For my full review of Octopus from 2 years ago, with yummy photos, just click here (note that prices have changed, but not too much). 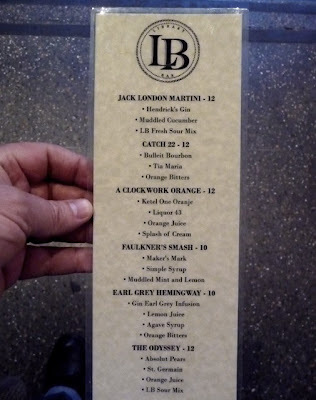 Another block away, within sight of L.A.'s beating bibliographic heart, the Central Library, is a new literary-themed watering hole mixing up drinks with names like the Jack London Martini, A Clockwork Orange and Faulkner's Smash. The gastropub is appropriately called the Library Bar. The drinks are in the $10 - $12 range (our bartender said one is all you'll need), but they do serve beer on tap at $4 happy hour prices until 8 p.m. The menu includes a Cobb Salad, Library Burger, or Roast Marrow bones for $9. Click here to see their website menu and general info. 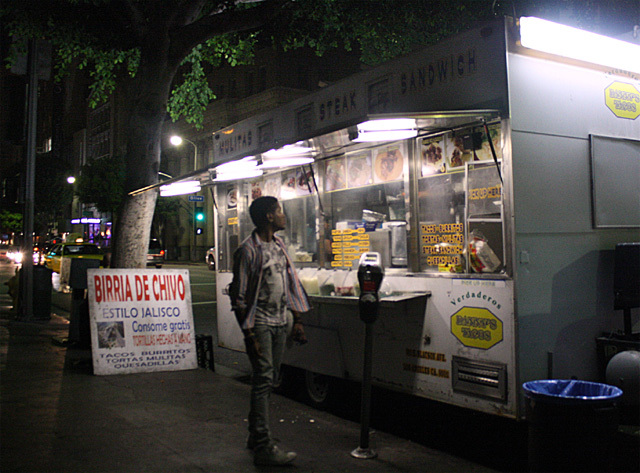 Travel further East on 7th, just past Olive Street, to find a great street-food trailer called Danny's Tacos. The specialty is Birria de Chivo -- a stew of goat meat that is fall-off-the-bone tender braised in a spicy and intensely flavored broth. The tacos are only $1.50, and the tortillas are handmade -- so soft and tasty. They park on the street just after 7 p.m. and stay open until about 2:30 a.m. To read what the Yelpers think, click here. Please note: Danny's Tacos is a food trailer, so they do change location from time to time -- best to Google them first to make sure of latest location. Back on the train heading west, you'll pass the Pico Boulevard station (at Staples Center - home of the Lakers, the Clippers, the Sparks, and the newly crowned, Stanley Cup winning, Kings), and then a few stations later, you'll reach the Crenshaw Boulevard stop, where you can see Earlez Grille right across the street. Earlez flame broils some of the best hotdogs in South L.A. The price is right too, with daily specials including a $1.25 Beef or Turkey Dog Saturday Special. For my full review, including photos and a video, just click here. Dessert awaits at the end of the line just off the La Cienega Boulevard station stop (my home destination.) When you step off the elevated train station and go down to street level, you will be beckoned by the sweet, odoriferous siren call of See's Candy. 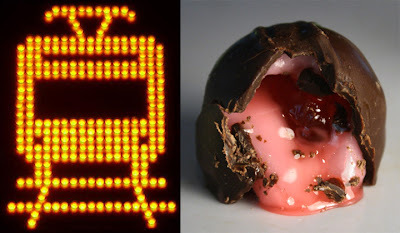 Follow your nose to where the melting chocolate fragrance permeates the air. See's Candy is just a block south on La Cienega Boulevard. Look for the large white building on the west side of the street -- you can't miss it (you can even see it from the train platform.) And best of all the samples are handed out for free! Believe me, I've had my share -- I've tried 4 at a time! (If you feel guilty about getting something for nothing, they offer a 3 piece sample bag for $1.69.) This is where I get Mom her sweets for Mother's Day, and you should stop by here for your sweetie, too. 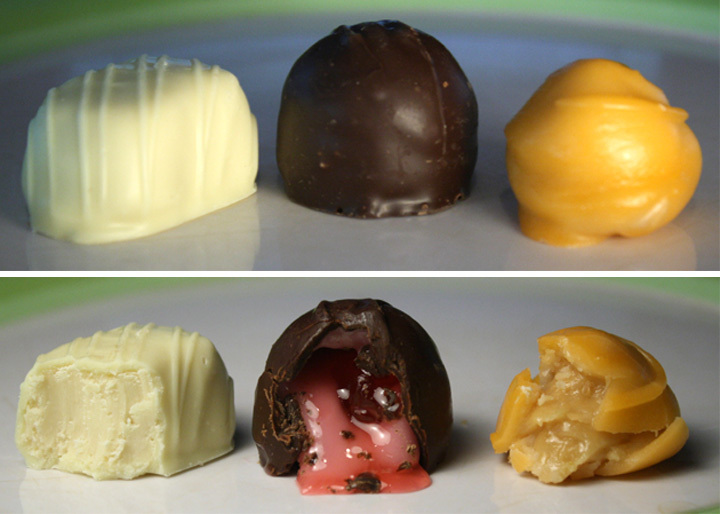 They have a large selection of classic confections, but there are plenty of delectable new flavors -- if you think they are too old-fashioned and you haven't been in ages, you'll be surprised at all the creative chocolates on their menu. For their latest sweet tooth selections, click here. The end of the line is in Culver City at Washington & Venice Boulevards. Just a short block and a half east, at about 8758 Venice Boulevard, is the Helms Bakery Distric. Dining destinations in this building complex, include two restaurants from L.A.'s innovative chef Sang Yoon: Father's Office, which help launch the gastropub reboot in L.A. and his latest, Lukson, a new take on Southeast Asian Cuisine. 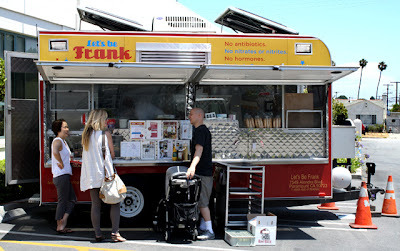 But if you don't want to spring for a $12.50 burger at Father's office, I can recommend a cheap meal of chemical and hormone free hot dogs from Let's Be Frank -- housed in a simple trailer in the Helms parking lot (across from Father's Office) serving delicious all natural hot dogs for $5.50. 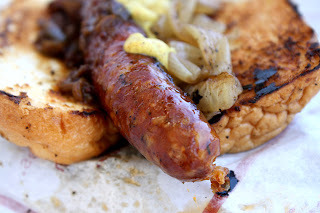 The wieners are sausages really, and much larger than the average hot dog. Even the sauerkraut and pickle relish is locally sourced and organic. This is such a great dining destination that I made a special Let's Be Frank blogpost, with a video that you can see by clicking here. And the cheapest epicurean has not forgotten about his vegetarian visitors. 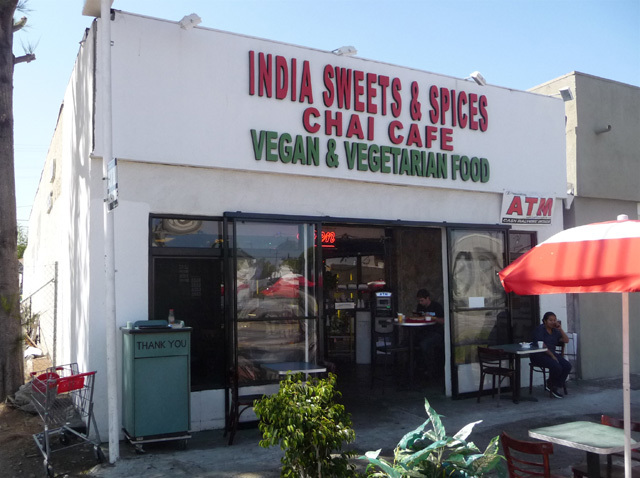 Three short blocks west of the Culver City Expo stop on Venice Boulevard is India Sweets & Spices. You can pick up curries, produce and spices in their market or get a great meal deal at their vegetarian buffet. It's a full meal with choice of 2 entrees, rice, yogurt, pickle and chipati for $5.50! 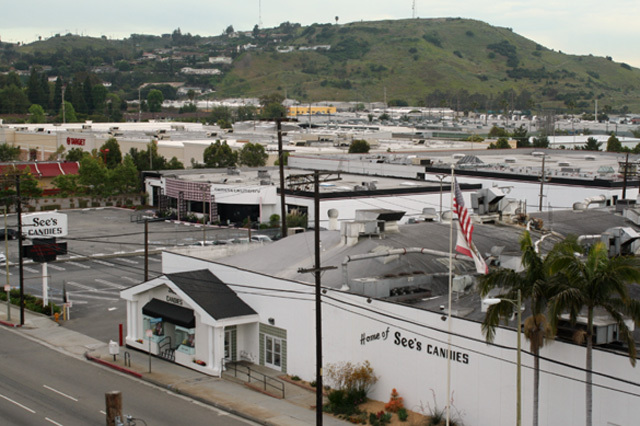 Finally look south a block away and you will see Culver Boulevard - L.A.'s most eclectic dining destination. 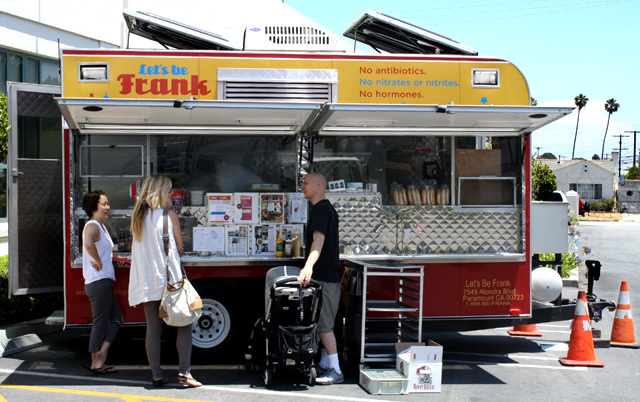 New and innovative eateries are springing up almost every month on this teaming boulevard. This blogpost would go on forever if I listed them all. Just click here to see some of them. I send out a big 99 thanks to the eateries I shot along the Expo Line; and an extra thanks to the LA Metro, its drivers, and my fellow commuters. So all aboard -- you have a free ticket to ride on L.A.'s newest public transportation hub, the Expo Line, with the Chintzy Culinary Conductor as your guide! Play it here. Video runs 9 minutes 27 seconds. 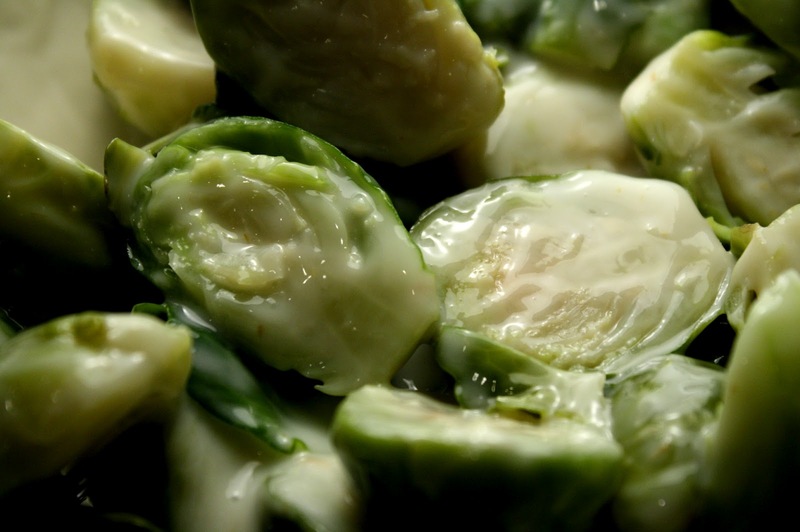 I've grown to love Brussels Sprouts. These mini cabbages, the size of ping bong balls, are quick to prepare and intensely flavorful. And even veggie phobic tots will chow down, that is, if you leave out the spicy horseradish part of my Brussels Sprouts in Spicy Sour Cream. This creamy and luscious dish can be served warm or chilled -- and it's perfect for picnicking, patio partying, or just served on the side. 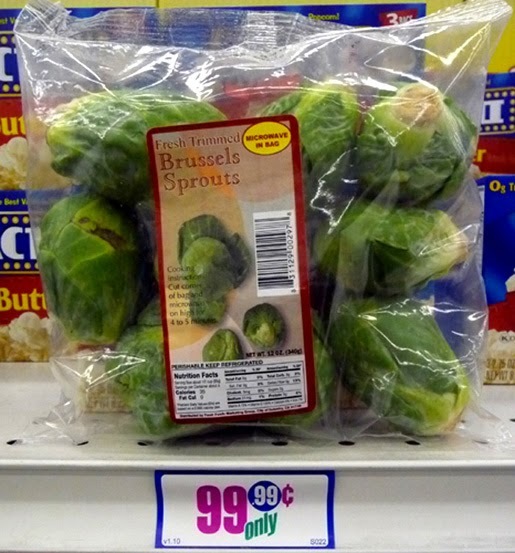 Brussels sprouts have been turning up in one pound to10 ounce packages at my local 99c only Store lately, and I'm taking full advantage coming up with ways to cook them. So do check back for more recipes. 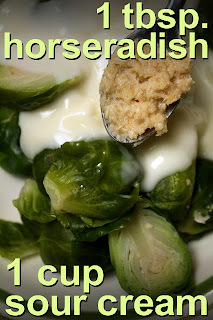 So try out my Brussels Sprouts in Spicy Sour Cream recipe sometime -- you can always adjust the horseradish heat for your picky eaters! 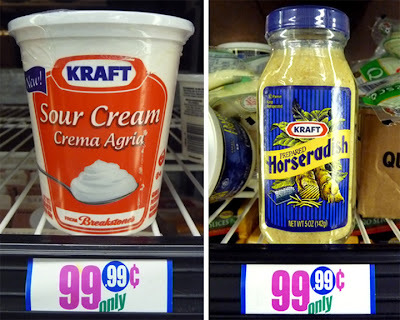 1 tablespoon horseradish - from jar. Add or subtract amount to suit any taste. Okay to substitute with 1/4 teaspoon (or less) cayenne pepper. 1/2 cup of water to steam brussels sprouts. Add about a 1/2 cup of water to a pot with a steamer rack and start heating up. 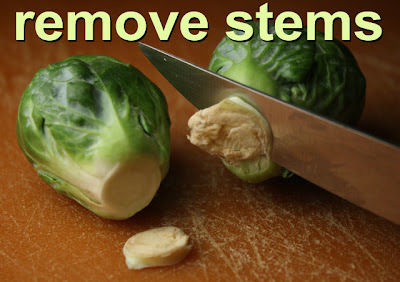 Rinse off brussels spouts and remove any older brown leaves, if necessary. Slice off the tough root (there is barely any there, so just do a thin slice.) and slice brussels sprouts in half. Add brussels sprouts to a steamer rack and steam on low heat for about 10-15 minutes until done (or lessen time if you like a crunchy texture.) Drain and add to a bowl. 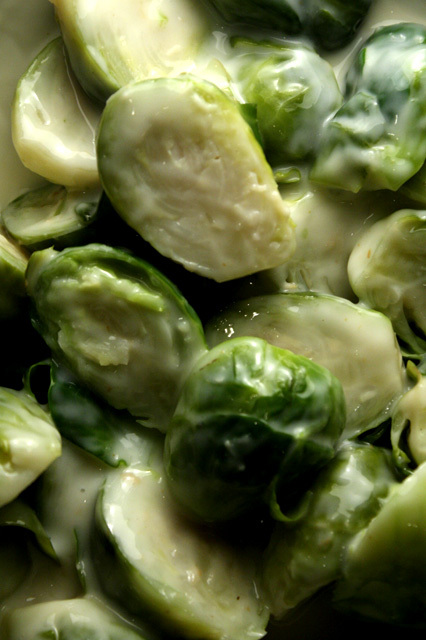 You can pre-mix sour cream and horseradish in a bowl -- or just add it all with the drained brussel sprouts, and gently stir it all together. Serve at room temperature or chilled. 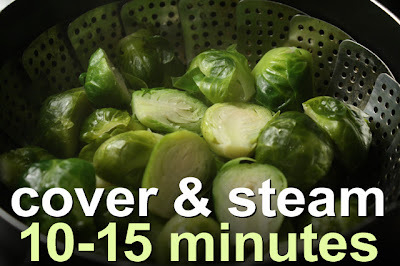 If you don't have a steamer with a strainer, just add a 1/4 cup of water to a pot with brussels sprouts, cover and steam until done - then drain. Check during steaming to make sure water doesn't cook out - add when necessary. I added a tablespoon of horseradish for a mild heat, but you could add more for a spicier version. Just taste as you add it for desired heat. 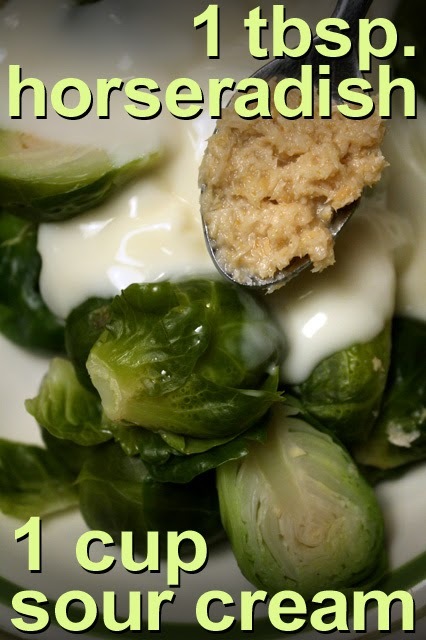 You can also add or subtract the amount of sour cream to suit your taste. Adobo is Spanish for marinade and Filipino cuisine has given it's Latin influence Oriental flare. 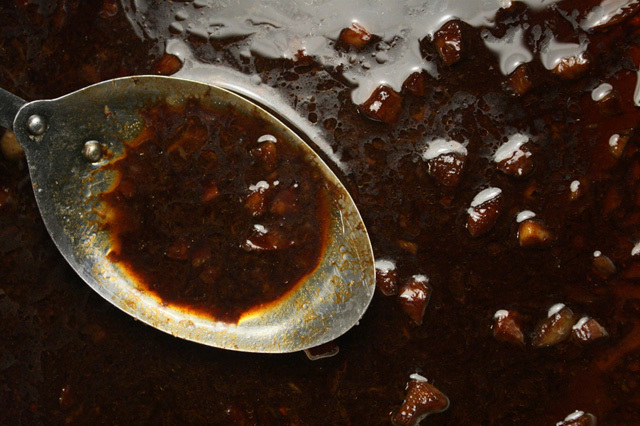 Extreme sourness from vinegar mixed into salty fermented bean soy sauce is one heady flavor bomb. Instead of clashing they actually compliment each other. And as the pieces of chicken braise, the marinade is mellowed even more. 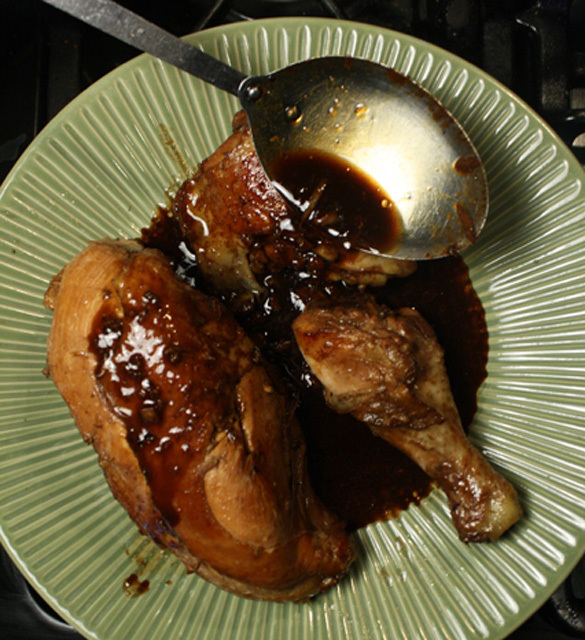 Chicken Adobo can be made with any cuts of chicken you can get on sale, including wings, legs and thighs. I got a whole chicken (for 77 cents per pound) and mixed in a bit of dark and white (and with the other chicken half I made a Jambalaya, recipe here.) The marinade ingredients of soy sauce, vinegar and garlic are certainly cheap enough. I looked up a few recipes and many of them called for letting the chicken pieces marinate in a mix of vinegar and soy sauce overnight. You can do this, but I found the flavors so intense that just braising was good enough, and after 20 to 30 minutes the marinade reduces by half, giving you an intensely flavored sauce. 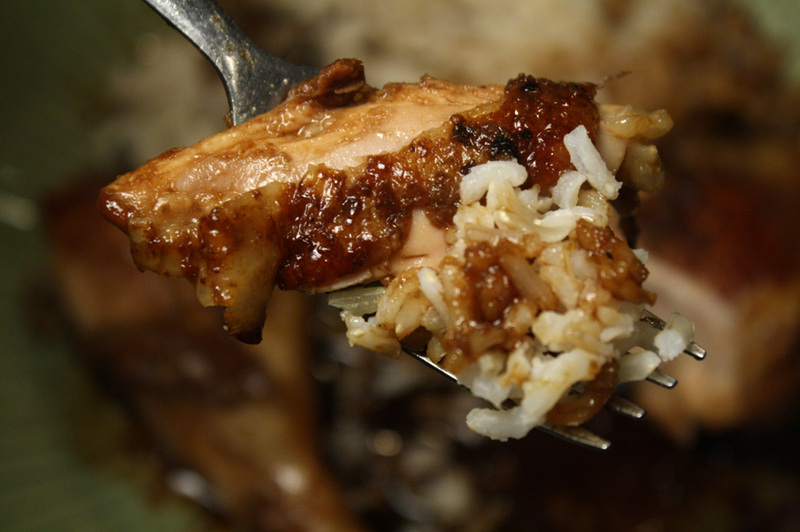 Chicken Adobo is typically served with rice. And, bon appetit or Kainan na! 3-4 pieces of chicken - I used 1/2 breast, a thigh, and a leg. 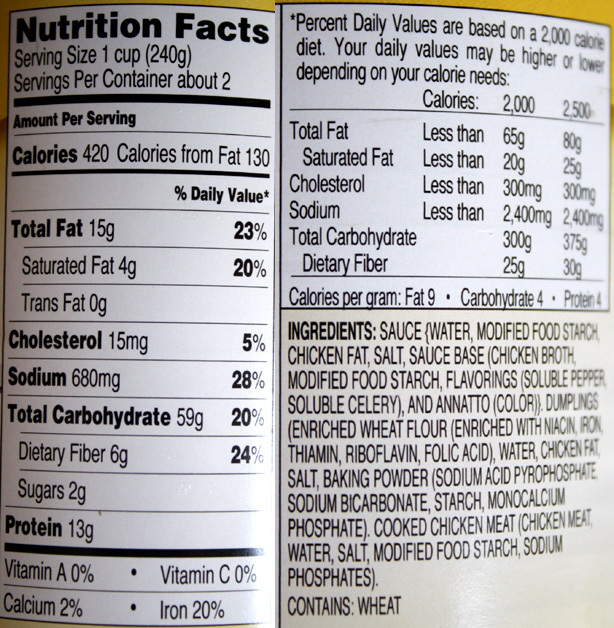 1/4 cup of soy sauce - Any brand, but I would lean toward a low salt. 1/4 cup of vinegar - I used white vinegar, but any type will do. 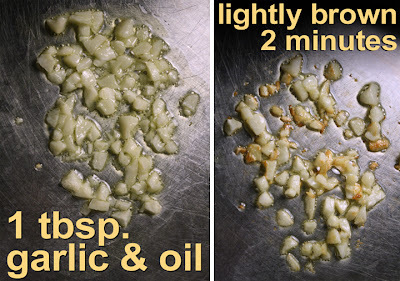 2 tablespoons of oil - one for garlic, and one for sauteing chicken. Black pepper to taste - optional. 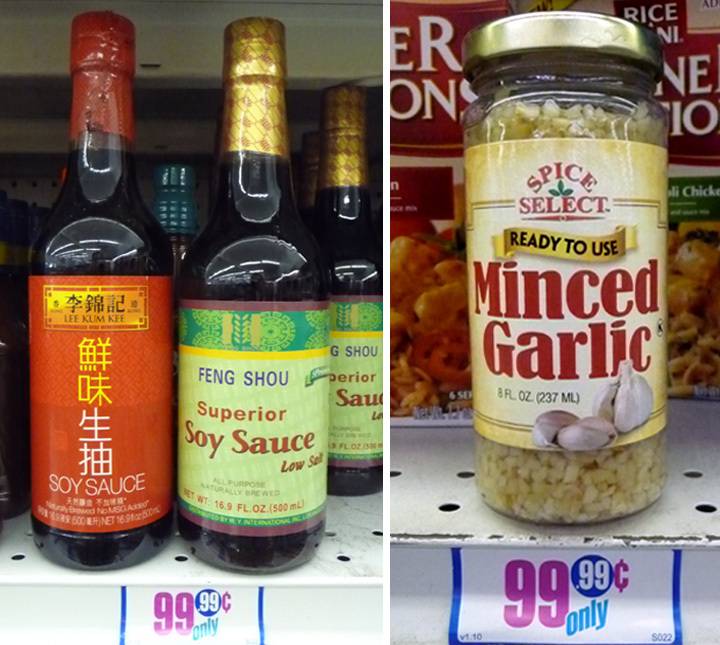 No salt necessary, as soy sauce has plenty. If you want a more intense and traditional Chicken Adobo, mix garlic, water, soy sauce and vinegar in a bowl with the chicken. Coat the chicken on all sides and cover to marinate overnight or at least a couple of hours. Or, skip this and go right to the following paragraph -- the marinade is certainly strong enough to just go right to braising. If you want to serve this dish with white or brown rice then start it and follow the package directions. In a pot or pan add oil and garlic. Over a medium heat lightly brown the garlic -- should only take a couple of minutes. Next add chicken pieces and the marinade of water, vinegar and soy sauce. Mix well and turn up heat until liquid just starts to boil. 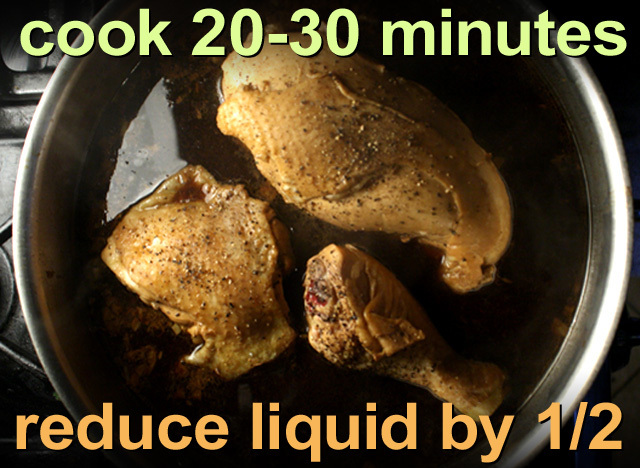 Immediately reduce heat to a low simmer and cook chicken 20-30 minutes uncovered, until done. Pierce the thickest part of the chicken to make sure juices run clear. Turn the chicken a few times during braising so all sides cook in the marinade. Check on the dish every ten minutes to make sure liquid doesn't cook out. Add a 1/4 cup of water at a time if it gets too low. 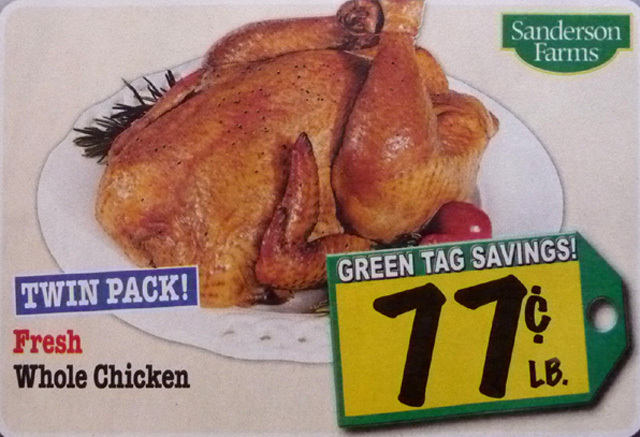 You want the marinade to reduce by about half, as chicken cooks. I went one extra step. When the chicken was done, I put it into another heated saute pan (with a tablespoon of oil) and crisped the chicken skin for about 5 minutes. 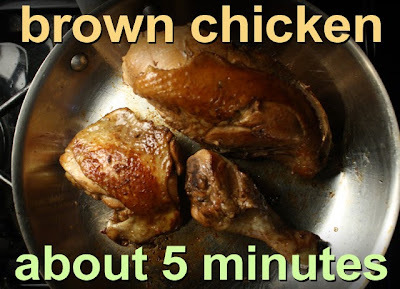 You could make the dish with skinless chicken and skip this step. 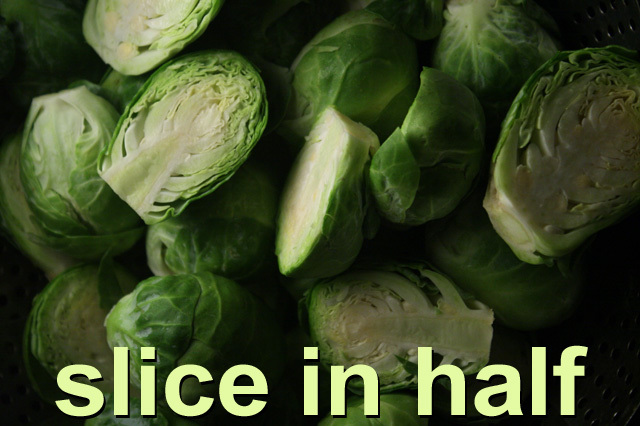 Serve over rice, a favorite veggie side, or salad. It's Spring and time to get your garden going! Last month I replaced my topsoil with fresh compost that I make from used coffee grounds and veggie scraps. And in the last two weeks I've made many trips to the Marina Del Rey Garden Center for tomato, lettuce and herb seedlings. I've been going here for a few years now and always find great deals. 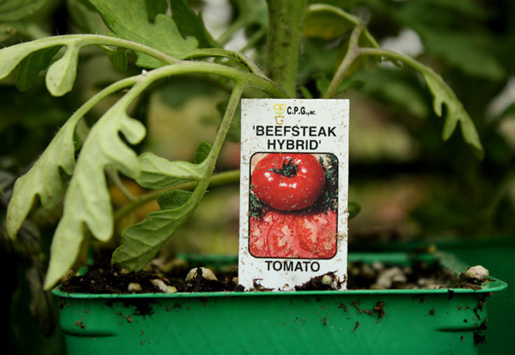 They carry many varieties of tomato plants; from tiny but flavorful Cherry Tomatoes, to hefty and juicy Beef Steak. 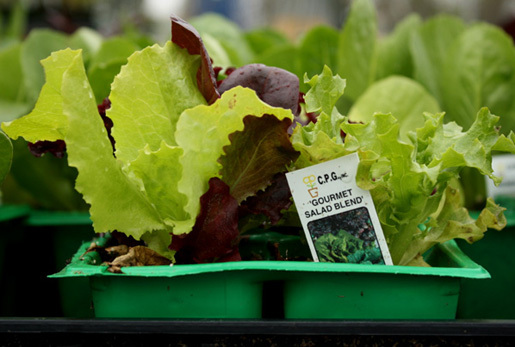 And I especially like the variety of lettuce flats -- everything from Mesclun Mix to Red Buttercrunch and Gourmet Salad Blend. They also have a small orchard of budding fruit trees, some starting to bear fruit -- so you know your first crop is definitely on the way. You can't get fresher produce than growing your own. And in my latest zany film foray, this green- thumbed budget horticulturist takes you on a tasty garden trek, with camera in hand. Now, you know this will not be a typical tour -- where The 99 Cent Chef goes, high jinx follow! 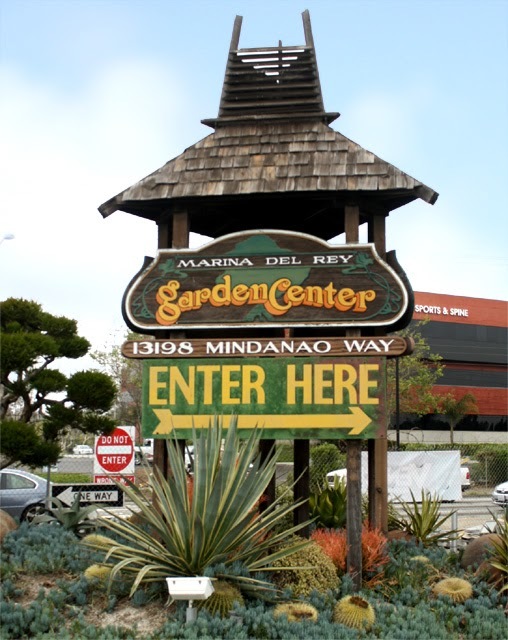 The Marina Del Rey Garden Center's staff is knowledgeable and helpful, but they give you the space to explore on your own. And, you will see how the Cheapskate Forager takes full advantage of nature's bounty! It's hard to resist plucking and tasting a tart Kumquat from a branch weighed down with the colorful fruit, and I'm sure almost everyone has snagged a Strawberry, Blackberry, or a Grape or two, from budding bushes displayed for sale. But, no one has gone to the extremes the Chintzy Gardener goes in this latest docu-comedy video. This time around I had some help from a couple of 99 Cent Players. Making her first appearance is Garden Master Elissa (a workmate & cool drummer); while the Omniscient Voice at the end is provided by my neighbor, and frequent contributor, Pete (aka Pedro Pe), a comedian and actor. Both Elissa and Pete provided additional camerawork, too. 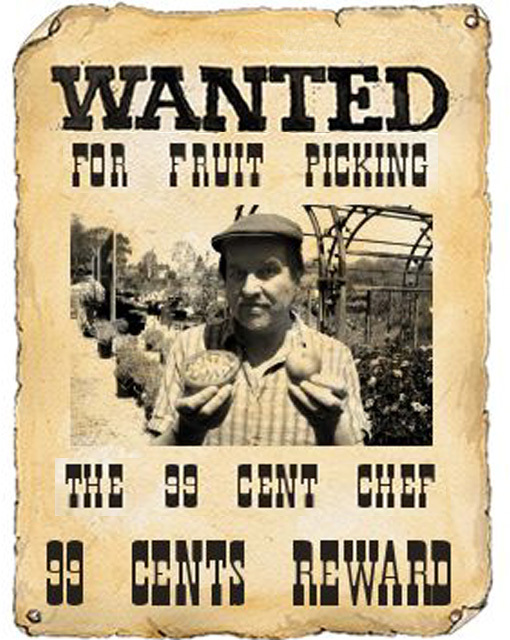 99 thanks to them, and also to the Marina Del Rey Garden Center and all their nursery gardeners. So sit back and let me give you a comedic tour of the Marina Del Rey Garden Center. It comes with a warning though: don't try what you see here at your own local nursery -- I'd hate to have to bail you out of the slammer! Play it here. Video runs 4 minutes 45 seconds. hours: 8am to about 5pm. Open 7 days. Please Note: I brought my own fruit, veggies and props to the Marina Del Rey Garden Center. I did pluck a grapefruit from the tree there, but used my own to eat from (there were a lot of grapefruits that had fallen to the ground, so I didn't feel too guilty picking just one -- which I left behind.) Finally, I bought the flat of lettuce used in the video. 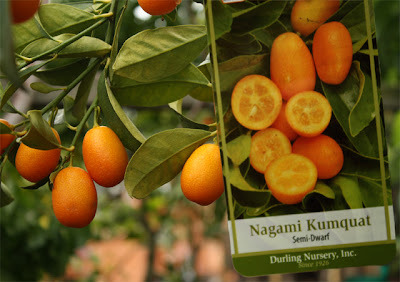 Although, I must 'fess up to noshing a handful of kumquats during several visits to the nursery. My garden Swiss chard plant is prolific this spring, and since it's colorful and nutrition loaded leaves are free for the picking, I'm adding it to my breakfast menu with a Swiss Chard and Cheese Omelet. Swiss chard is milder than collard greens and cooks in a fraction of the time. It's not as delicate in flavor as spinach, and not as soggy -- so you get some texture in each bite. Even the brightly colored stems are tender and edible. 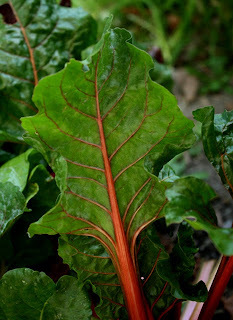 Chard comes in a variety of colors, from all green to red stemmed, and even a red wine color for the whole plant. I made a Breakfast Frittata (click here for recipe) last weekend and added a handful of sauteed chard. I've even added chard to my cheesy Baked Pasta with Cauliflower entree (video recipe, click here.) I usually roughly chop the leaves and give it a quick 2 minute saute in a teaspoon of olive oil to soften. You can substitute oil with a couple tablespoons of water and just cook a few minutes until leaves wilt and water cooks out. 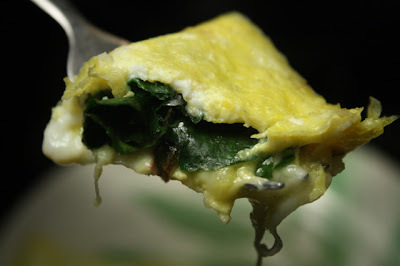 You could add the sauteed Swiss chard to a simple egg scramble, but I think it pairs with cheese for an interesting spin on the typical Diner breakfast Spinach Omelet. 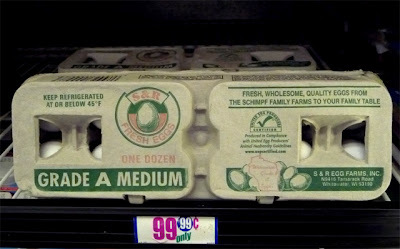 For this omelet I used 99c only Store shredded mozzarella cheese, but you could use any favorite. You can't get much cheaper than eggs as a main recipe ingredient. And you will use very little of more expensive cheese. 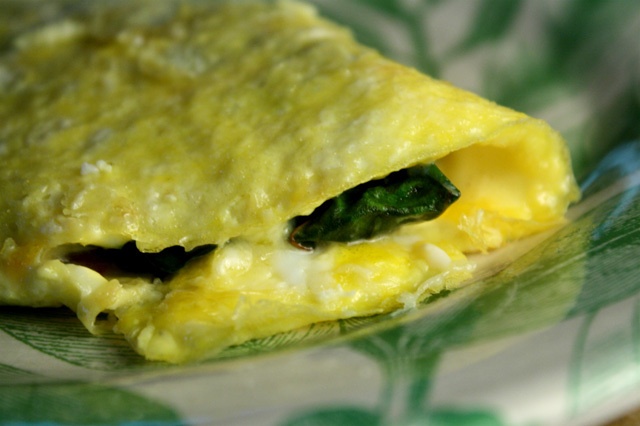 You can follow this recipe and make a regular spinach omelet -- or, to add some extra fresh flavor to your morning omelet, give The 99 Cent Chef's Swiss Chard and Cheese Omelet a go. 2 to 3 eggs - I made mine with 2 medium sized eggs. 1 teaspoon milk - optional to mix into eggs. Handful of Swiss chard - about a cup, roughly chopped. Okay to substitute with fresh or frozen (thawed and squeeze/drained) spinach. 1/4 cup of shredded or sliced cheese - any favorite, I used mozzarella. 2 teaspoons of cooking oil - I used olive oil. One teaspoon to saute chard, and one teaspoon to fry the omelet. 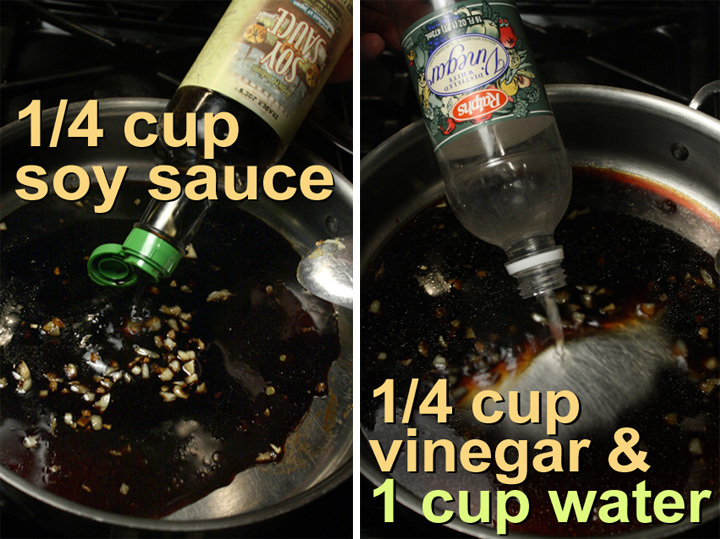 Okay to use as little oil as you are used to, including canned cooking spray. Wash and rinse a handful of Swiss Chard, then chop. 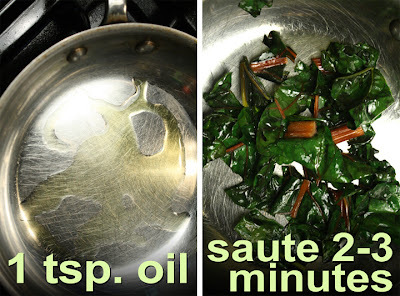 Heat one teaspoon of oil in a pan and add chopped Swiss chard (or spinach.) Saute 2-3 minutes until soft and wilted. 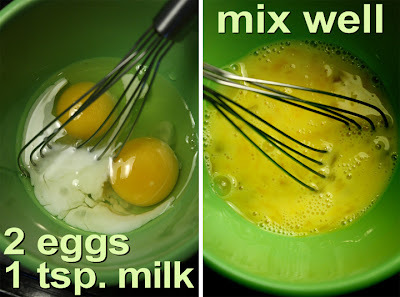 Meanwhile, whisk 2 eggs together in a small bowl for your omelet. 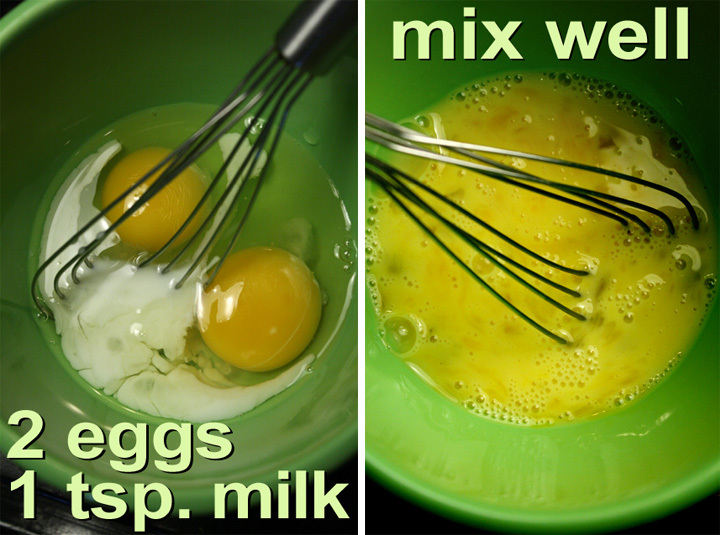 I like to add a teaspoon of milk into the eggs -- make your egg omelet base any way you like it. There are several ways to make an omelet. I've seen the fancy chef way: it's almost like making a soft egg scramble and rolling the egg over the filling, like you would fold a burrito. I do mine simple, just pour in the egg and let it cook a minute; add the fillings; cook until egg liquid it almost gone, then fold it in half. Sometimes it sticks and breaks and leaks -- most of the time it doesn't. So first, into your favorite egg frying pan over a medium heat, add a teaspoon of oil. Swish oil around to coat the pan. Add egg mixture and allow to cook a minute. Next add the Swiss chard on one half of the omelet and cheese on the other side. Let the egg cook until almost all the egg liquid is gone -- the omelet surface is glistening but still slightly damp, about 3 minutes. With a spatula loosen 1/2 of the omelet, then lift and fold -- cheese onto the chard side. Season with salt and pepper to taste (you can season anytime during cooking process.) Cook the omelet for another minute or so. You can make a small slice into the omelet to check for desired doneness.